I don’t know if the guys at the Emirates palace Hotel are still looking for stuff to hang in the world’s most expensive Christmas tree, but just in case they are, here is the world’s most expensive Christmas ornament . This particular Christmas decoration features 1,578 diamonds encrusted in 18 carat gold and has two rings encrusted with 188 rubies. 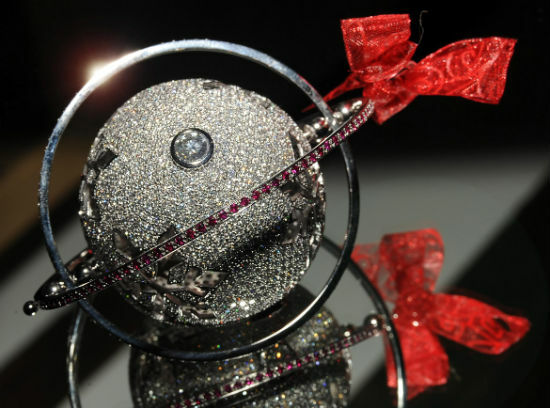 And, as if it wasn’t blinged-out enough, this one of a kind ornament also has 3 1-carat Roman diamonds encrusted into the sphere. The world’s most expensive Christmas bauble was hand crafted by Embee Jewels London, in partnership with Hallmark Jewelers , and is scheduled to be sold in an auction. 15% of proceedings will go to the National Autism Society, the UK’s leading autism charity.